Looks like a pretty good round. I voted for Rage. I like the aesthetic environment for the coaster. Wilderness Launcher looked good; but the lack of screenshots leave a lot of blank spaces. It's a little disappointing; Wilderness Launcher looks pretty good, but it could've used a few more screenshots. And here we have yet another round that gets me excited when I see the first screens in this thread, and lets me down a ton upon viewing the entries. There are two good ones here, but we also have two that need a lot of work. 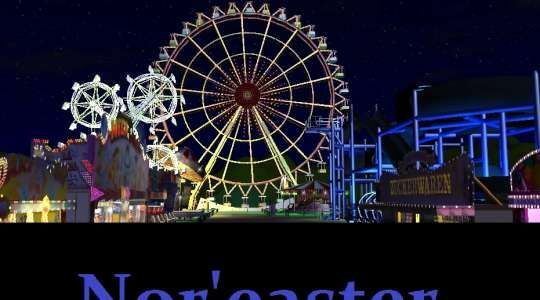 Rage: Probably the best RCT3 we've seen in the competition since the last time that Nozem entered, and the one that will likely claim my vote. Great job with the screens, as well as your work on the structures and overall ride layout. The terra painting probably could use a bit more work after seeing the aerial view, there's a small Zero-G roll right before the MCBR that probably needs a rework as it's too quick (not sure as to how quick it is though since the video is a tad laggy and that impacts the viewer's ability to determine speed tremendously), and it'd be nice to see flanges on those supports. 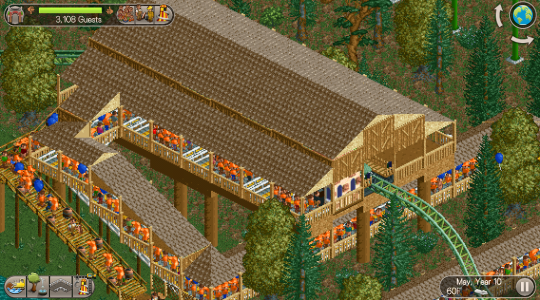 Other than that though, this is a pretty good RCT3 entry, nice job. Nor'easter: I have no idea what you were going for with this entry... Was it supposed to be an intense water ride or some sort of gentle, almost lazy-river kind of ride? Most of the POV was watching the dingy slowly meander through curves as the ride never has an opportunity to build up any kind of speed. If you want to make one of these in the future I highly suggest using the Aqua Blaster ride type, this way if the ride comes to a crawl like shown here you can add boosters to remedy that. I also have no idea why you added six screenshots of trucks on a highway... yeah it's a ride that's meant to be reassembled and moved quickly, but showing pictures of a fleet of trucks on the highway doesn't mean anything to voters, it's one of those 'tell us, don't show us' things. Timberwolf: The second entry that met expectations after viewing, I quite like this mine train coaster. With that being said, something about it just feels... unfinished. This isn't to say that it is unfinished, it just appears as though it isn't done yet (to me anyway). A good entry, but I don't think it's as well done as Rage in this case. 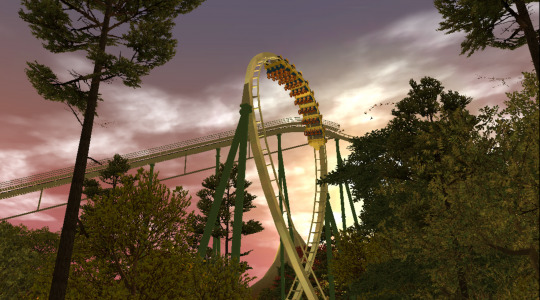 Wilderness Launcher: Here we have yet another RCTC entry that doesn't belong, please view previous winners before entering your projects. I voted for Timberwolf as well. Thought it was the most well-thought out and polished entry. Rage, while really cool aesthetically, was a bit off in the pacing of the coaster. It took some inversions very very fast, and that turned me away from it. Nor'easter was again, cool aesthetically, but it meandered in a lot of places that broke up the overall feel of the ride. Finally, I wish I could've seen more of Wilderness Launcher. Some full screenshots of the whole coaster as well as some highlights of different areas of the ride would've painted a better picture in my head. Rage has an oddly specific theme and story to it! Odd is good here. Always like seeing that kind of stuff. A little bit of a let down that the theme didn't exploit that much. It's almost as if the text didn't matter or was an after-thought, which is sad. The theming looks quite decent, and one of the better foliage jobs I think we've seen since the last few rounds. A very solid entry that I think might win, although its generic theming might hurt its chances a little. Nor'easter tries some interesting stuff (probably more unique than the other entries) but it backfires a little, as the ride isn't quite as thrilling as it looks but its appearance makes it look like your standard money rake for a state fair. Are state fairs this dimly lit at night, btw? Also, would have appreciated day-time photos of the ride. Night is great but ultimately a little deceiving for me. I really admire your ability to quickly whip up rides for Build-It! but would really like to see you spend time on something that is more than a throwaway in this [more or less] weekly competition. It's sometimes worth it to wait for a round to start if even two of the entries in it are better than the usual schlock. Timberwolf is yet another pleasant outing into trackitecture NCSO. The setting is quite easy to identify and pleasantly executed, but I'm not sure if the ride itself is themed to something specific or not. A great choice of roofs and walls in general, though it falls trap to a little wall spam on the green building. You've gotten better since then, I'd like to think, but it's nothing too bad. The support job is pretty well done as far as NCSO goes, too. I'm inclined to vote for this, but Rage seems a good choice as well. Wilderness Launcher's name sounds a little uninspiring and so does the entry itself. You've got a good thing going here and I hope you get to learn and build better the more you play the game. I'm afraid something this simple might not get anyone's vote in Build-It!, especially if there are more 'complete' looking entries. Like Chris says, do view previous winners (especially any RCT2 ones) to understand what the competition is like. Rage: I think everything Chris said way back at the beginning stands pretty well. My big nitpick is the inversion after the cobra roll. I don't have a problem with the theme not being executed that well during the ride because I can see where it would be difficult to add theming during a ride this big. The only thing I think could have been done was a shed at the end, but we all remember how that turned out. Nor' Easter: You had my attention, then I watched the POV. I think this is a good ride, but it needs more. it needs a good layout, and a theme would be nice. I don't think this is your best entry, but I do think you are improving. 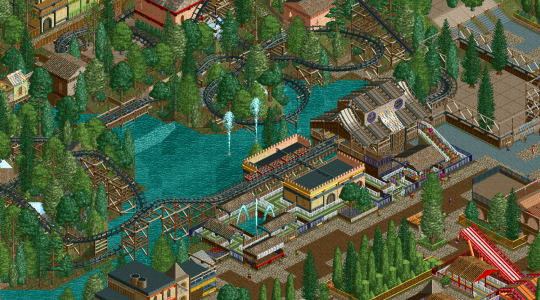 I don't have much CC here from lack of experience with water rides so I will leave it at that. Timberwolf: I like it. This is a solid entry. This and Rage seem to have a score to settle. The only thing that this really needs a good back story to go with it. For that reason, I am giving my vote to Rage. Otherwise, this ride is perfect. Wilderness Launcher: This needs some work. Please look at the quality of previous entry before entering.